BoSu is and was many things. When we started, our collective desire was to be in a band that could play any style we wished. Many bands inspired us in merging various genres. Most were considered jam bands and we also grew in that vein. 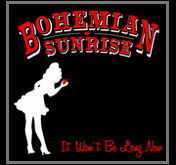 Our name, Bohemian Sunrise, was especially fitting for that era of the band. Our passion, mixed with a bit of luck and good timing, opened the door to many wonderful opportunities; however, looking back, we can see that we needed more time to grow, musically. Our line-up also evolved, ebbing and flowing as life changed for each member. With the most recent line-up transformation, the core members have decided to take the transition one step further and become a new entity, dropping the name Bohemian Sunrise, in the process. This wasn't a decision we came to lightly, but it is one we were unanimous in deciding. Throughout the years, we have considered a name change as our musical tastes would modulate, but it seemed like Bohemian Sunrise was always the best fit in that moment. Yet now, more than ever, it has become clear to us that the name belongs to a former version of ourselves. It no longer serves us and frankly, we believe it has become limiting. We, the four core members (Ed, Jimi, Adina, and Dom), have remained united in mission and music and have found renewed passion as a group. In that spirit, we have begun a new project: Elephantsoul. While some songs from the last BoSu album will be part of the repertoire, we have already begun to transform them in alignment with our new vision. Elephantsoul takes the best parts of what was Bohemian Sunrise and merges them with a renewed vigor; the end result being funky, soulful, and diverse. We've had years of fun as BoSu and met a ton of friends along the way. We gratefully thank everyone who helped and enjoyed the ride with us and we hope to see you again, as we continue on this journey!